Day of the Dead: Bloodline, is a new reimagining of George A. Romero’s cult classic, set in a post-apocalyptic, zombie-filled world where a former med school student is tormented by a dark figure from her past. The only thing is, he’s a half-human, half-zombie hell-bent on destroying her world. 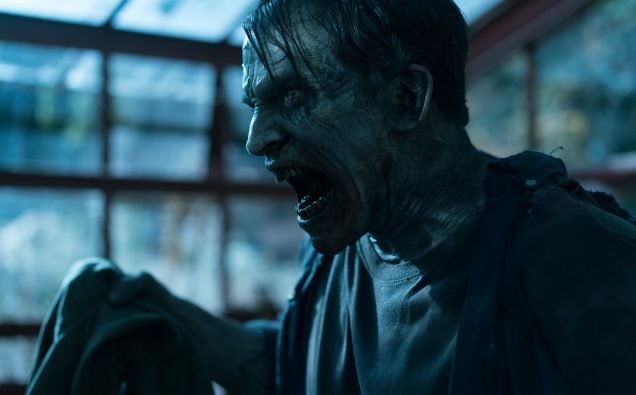 I really loved this version and the new imagining of the original “Bub the Zombie” from George Romero’s film. Jonathon Schaech really brings to life, (or undead, as it were) an intense character, that I think will help set this film apart from just being a remake and let it be a movie that stands on its own. 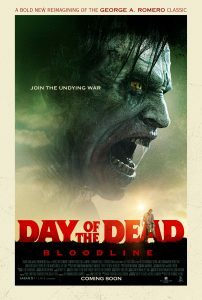 Great cinematography, zombie gore, SFX makeup and acting make this a perfect film for any zombie loving fan! I know we are up to our necks deep in undead films, but this one looks super good. Check out the trailer and watch it on VOD or at theaters, starting Jan 5th, 2018! Saban Films will be releasing DAY OF THE DEAD: BLOODLINE in Theaters and on VOD and Digital HD on January 5th.